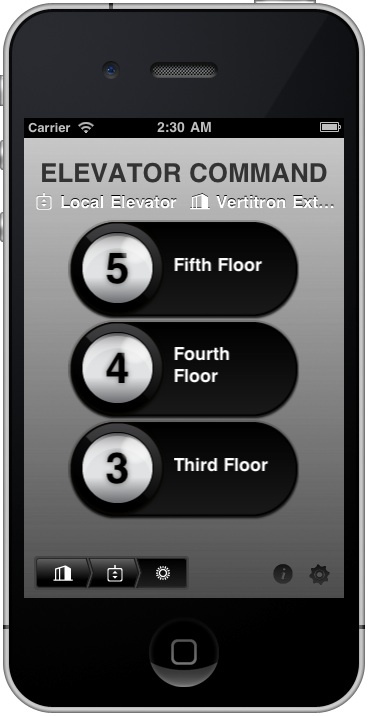 The first iPhone app for wirelessly controlling passenger elevators. The Appello elevator control application allows users to remotely call elevators and view their current status in real time via an iPhone or iPod touch. Centralized device management for greater security (can disable access for a specific user at any time). Flexible per-elevator command configuration allows support for elevator installations with varying capabilities and command sets. Developed End to End Architecture – in addition to designing and coding the app, Enharmonic designed the overall architecture and wrote the central management server software that contains elevator metadata and handles device security. We also consulted on the design and development of portions of the embedded controller software that translates commands between the iPhone app and the elevator controller.